MAYOR of the West Midlands Andy Street has launched a year of celebrations marking the 250th anniversary of the birth of Birmingham’s famous canals. Speaking at the Annual Public Meeting of the Canal & River Trust’s West Midlands Regional Advisory Board the Mayor welcomed the anniversary and emphasised the important role that the region’s waterways continue to play through improving health and wellbeing, increasing tourism and providing routes for sustainable transport. The meeting, held at Birmingham Council House on Thursday 10 January, was attended by local authorities, healthcare bodies, boating organisations and community groups from across the Midlands. The event kicked off a year of festivities celebrating 250 years since the first branch of the Birmingham Canal, between Birmingham and the collieries of West Bromwich, was completed in November 1769. A programme of events will be taking place throughout the year giving local people the opportunity to celebrate the milestone. Attendees heard about how the Trust, the charity that cares for 2,000 miles of canals and rivers in England and Wales, is working with local partners, community groups and volunteers to improve waterways for everybody. They also learned more about how the region’s formerly industrial waterways, which are free to use, can today help to improve the health and happiness of the millions of people living and working alongside them. Andy Street, Mayor of the West Midlands, said: “It was a great pleasure to attend the meeting and to launch the 250th anniversary celebrations of the Birmingham Canals. It promises to be a really exciting year on the waterways, not just in Birmingham but across the West Midlands. 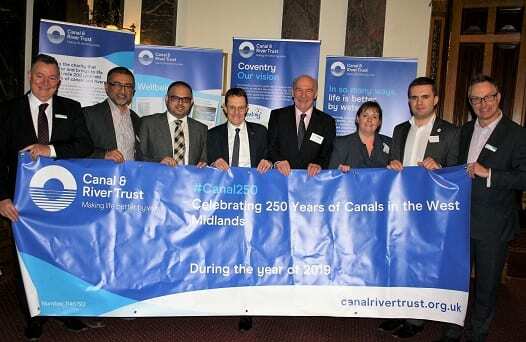 John Hudson, chair of the Canal & River Trust’s West Midlands Advisory Board, said: “It was fantastic to welcome the Mayor of the West Midlands, and representatives of organisations from across the region, to celebrate the importance of our local waterways and kick off the 250th anniversary celebrations in style. “250 years on these canals remain full of life and continue to play a vital role in modern society. On the doorsteps of so many people here in the West Midlands they offer endless opportunities for tackling some of the health, wellbeing and social challenges we face in the region. Coun Waseem Zaffar, Cabinet Member for Transport and Environment at Birmingham City Council, which kindly hosted the meeting, said: “Birmingham’s canals are a reminder of the city’s unique industrial heritage and they are just as important today for very different reasons, as a location for boaters, cyclists, walkers and runners.